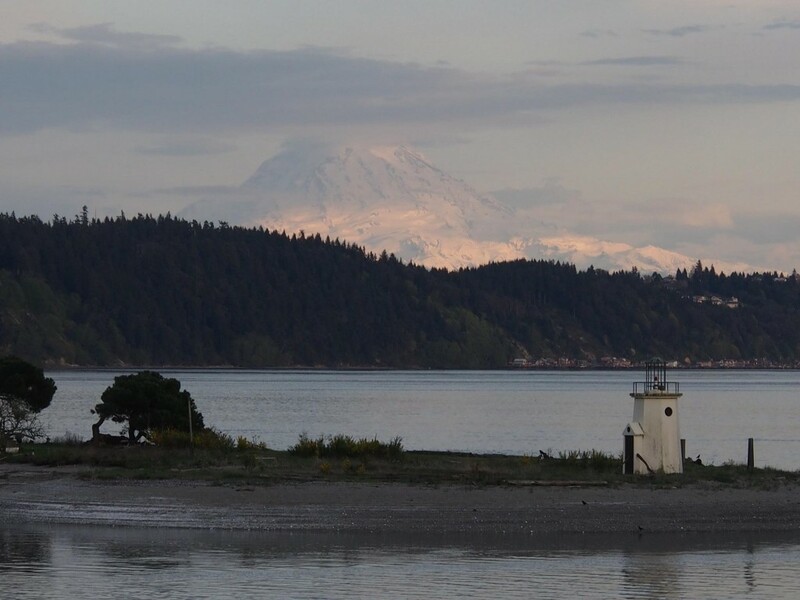 Stunning views of Mount Rainier, as seen from Gig Harbor. Gig Harbor may be just a short drive across the Narrows Bridge from Tacoma, but it might as well be a world away. Because of its rather isolated location on the Kitsap Peninsula, Gig Harbor was only reachable by boat or lengthy drive to circumvent Puget Sound until 1940 when the first suspension bridge, nicknamed “Galloping Gertie” for the way it undulated in high winds, was built. There have been several reconfigurations of the infamous bridge since then, but the wonderful “hidden away” feeling in Gig Harbor remains. The town was originally named in 1841 after a scout from the Wilkes Expedition discovered the hidden cove in a “gig,” or captain’s boat, while seeking calmer waters from a storm. Later settled in 1888 by fishermen from Croatia, Norway and Sweden, their heritage and legacy are still recognized and celebrated today. This living history is most evident in the 17 still-standing “net sheds” that line the waterfront, where fishing nets and gear were stored when not in use. The largest net shed (and one of the few open to the public) sits at Skansie Brothers Park, now a popular gathering spot for summertime open-air concerts, movies and festivals. Views of Skansie Brothers Park, including statue memorial to 8 fishermen lost at sea. Bottom right: Historic Skansie Brothers Net Shed. Panoramic view of Gig Harbor waterfront. Click on photo to view larger size. For visitors, Gig Harbor offers a relaxing respite, with sweeping views of Mount Rainier and the snow-capped Cascade Mountains. There’s no shortage of things to do, from kayaking the cove to a variety of festivals and farmers markets held throughout the summer. Here’s some favorite—as well as a few brand-new—activities and destinations around Gig Harbor to help to inspire your next visit. 1. Get Out on the Water: For those that don’t already own a vessel, but still want to take in some sun and water views, there’s a few ways of doing so. 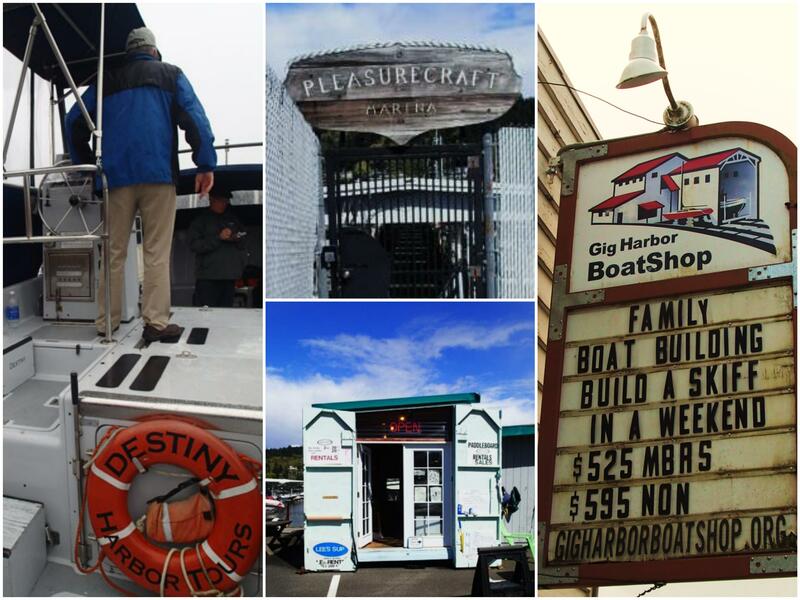 Clockwise from top: Going for a harbor cruise with Captain Tom of Destiny Harbor Tours; Houseboat rentals at Pleasure Craft Marina, Build a Skiff workshops at Gig Harbor Boat Shop; Lee’s SUP rentals. As one of the only nautical tour companies in the area, Destiny Harbor Tours operates daily, guided excursions from June to December, departing from the pier on Harborview Drive at Anthony’s Restaurant. 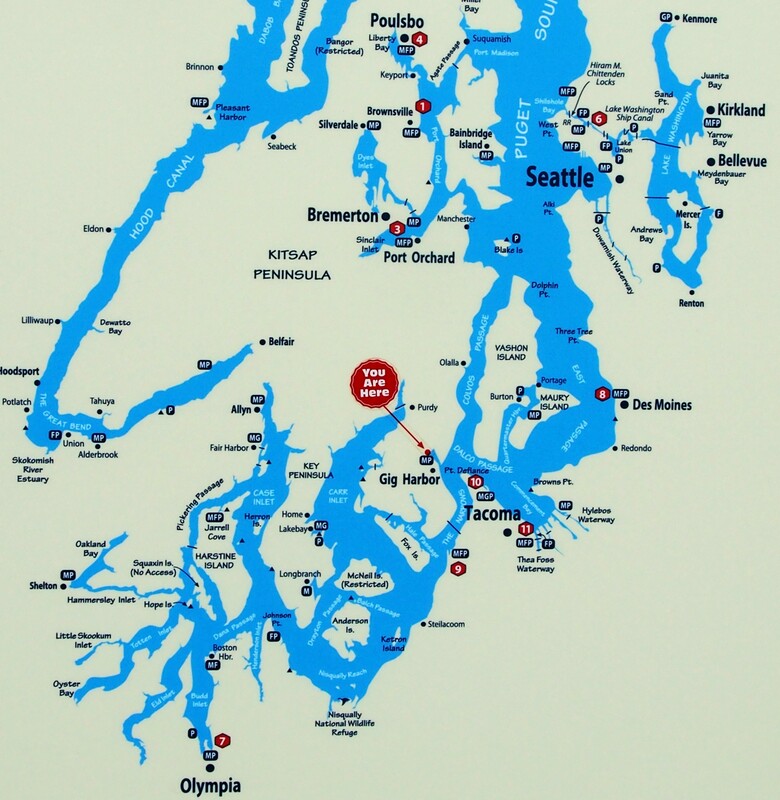 Choose from one- to two-hour sightseeing tours or private charters that include great views of Mount Rainier, Puget Sound, Point Defiance and perhaps a glimpse or two of bald eagles and seals. Captain Tom Drohan is an entertaining, knowledgeable guide and his seafaring fleet includes two authentic, completely restored U.S. Navy boats, Destiny and Maritime, both of which are U.S.C.G.-certified to hold 33 passengers. Recommended. Want to steer your own? Powerboats and kayaks can be rented by the hour or day from Gig Harbor Rent-A-Boat. Kayaks and stand-up paddleboards can also be rented from Lee’s SUP. Want to build your own? The Gig Harbor Boatshop offers two-day boat-building weekend workshops, where groups of two to five (ages 8 and older) will be introduced to the proper tools and methods to build their own 12-foot, 90-pound Salt Bay Skiff. Upon completion, boatbuilders take part in a ceremonial launch of the newly built skiffs for their maiden voyages around the harbor. $595, includes all instruction and materials, except for finish and oars. For those that prefer floating to sailing, fully equipped houseboats can be rented overnight from Pleasure Craft Houseboat Rentals, starting at $138. All six modern, stationary houseboats are fully furnished with linens, toiletries, cookware and dishes and make for an interesting alternative to a hotel stay. NetShed No. 9: Delicious pancakes with bacon and fritatta with house hot sauces. 2. Sea-Foodie Haven. There is an unusually high proportion of great restaurants per capita in Gig Harbor, which is pretty remarkable for a city of its size. Most are situated around the bustling waterfront, not only for the proximity to great water views, but for access to fresh-caught seafood by local fishermen as well. One of the more notable culinary-oriented transplants to the area is chef duo extraordinaire Thad Lyman + Katie Doherty, who first purchased the Northwest-inspired Brix 25 restaurant in 2009 with the intent of creating “fine dining without attitude.” Given their creative use of local, organic fare and the amazing list of craft cocktails, I’d say they’ve succeeded. Their latest endeavor is Net Shed No. 9, housed in the only other public-access historic net shed (besides #13 in Skansie Brothers Park). 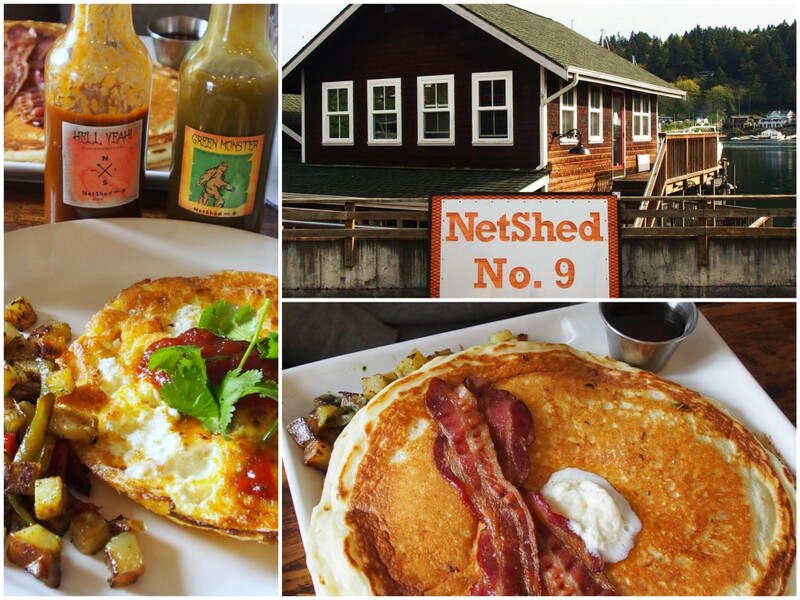 Lyman describes his latest restaurant as a “chef-y, upscale breakfast place, because you don’t always want a greasy spoon.” And it’s true, the menu offerings at Net Shed No. 9 are anything but standard brunch fare. Standouts include sourdough ricotta pancakes, chicken and waffles, stuffed biscuit sandwiches, chilaquiles, ham steak, frittatas and scrambles, as well as waffles made on Lyman’s collection of 100-year-old waffle irons. Netshed also has its own line of hot sauces, like the “Hell Yeah” (red) and “Green Monster” sure to please any heat-seeking aficionado. The team also has plans to open a third restaurant soon in the Brix 25 space, which will relocate to the former Ship to Shore waterfront space, but is being very secretive about what exactly it will be. I can’t begin to guess, but judging from the imaginative offerings at their first two restaurants, it’s bound to be a winner. 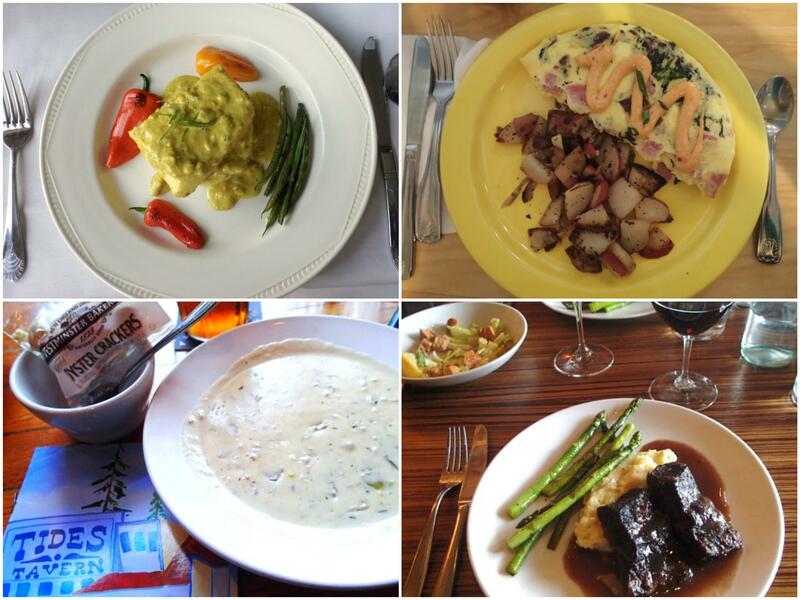 Clockwise from top: Halibut in yellow curry at The Green Turtle; Ham and peppered bacon omelet at Devoted Kiss; Barolo braised beef at Morso; ‘famous clam chowder’ at Tides Tavern. The Green Turtle: Looking for fine waterfront dining with a stellar view of Mount Rainier? This is the place. The Green Turtle’s menu promises fresh seafood, meat and organic produce on the menu and owner Sue Glenn and her culinary team deliver. The halibut covered in yellow curry sauce with roasted peppers and green beans was moist, tender and extremely flavorful, while the Porterhouse Pork Chop with toasted almonds was tender and juicy, cooked to perfection. In cooler months, look for their clam chowder on the menu, which was the perfect consistency, not too thick or too thin. JW Restaurant: JW consistently and deservedly appears in local “Best Of” lists, this year for “Best Romantic Dinner” and “Best Chef” with mouth-watering “creative comfort cuisine” from Chef Eddie Williams, paired with an imaginative cocktail list. Devoted Kiss Cafe: Another cozy brunch spot along Harborview’s main drag with classic breakfast and lunch menu items, as well as more inventive fare like Smoked Salmon Benedict and Cuban paninis. Tides Tavern: The eclectic Tides Tavern by the Maritime Pier has been a local mainstay since 1973 with its hearty Northwest-style, locally sourced pub fare, like fish ‘n’ chips, pizza, burgers, steaks, seafood, salads and a mean cup of chowdah. The Tides also boasts the best selection of local craft beers on tap, including the Tides Tavern IPA + Double IPA, custom-crafted by 7 Seas Brewing. Morso Wine Bar: This warmly lit, upscale bistro and wine bar offers an extensive, impressive wine list that earned it a spot on OpenTable’s Top 100 Wine List Restaurants in the nation. Great for lunch or dinner, but the real gem is the happy hour menu, served Tuesday through Friday, 4-6pm, featuring great deals on craft beers, wines and bubbly, as well as reduced prices on menu favorites like delicious flatbreads and crostinis, Canteloupe Bruschetta, Roast Beef sliders with horseradish or Bulgogi lettuce wraps. Don’t forget the truffle popcorn! On rainy days, Morso extends their happy hour by an hour for every 1/4-inch of rainfall that day. When it rains, they’re pouring. 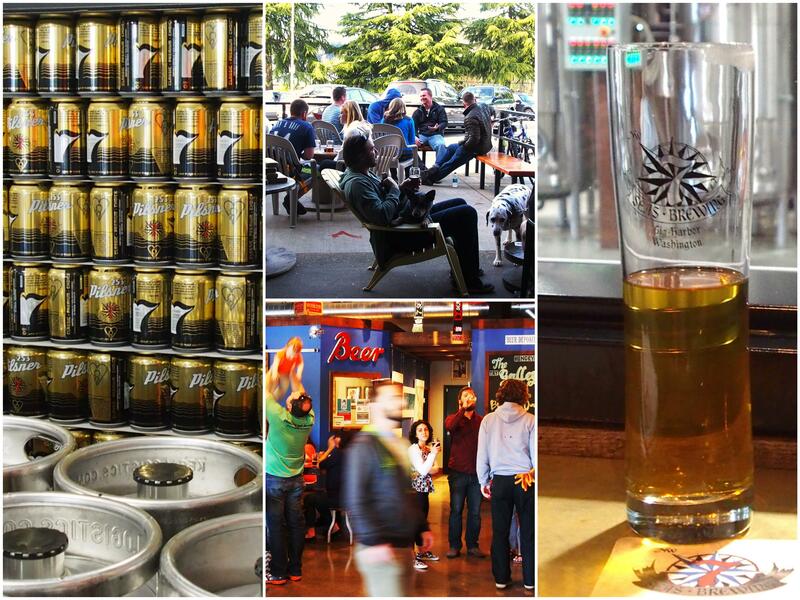 Clockwise from left: 7 Seas 253 Pilsner in cans and kegs; outdoor pet-friendly patio; tall glass of delicious, frosty 253 Pilsner; 7 Seas taproom. 3. Raise Your Spirits. 7 Seas Brewing is Gig Harbor’s first craft brewer since 2008, “championing environmental stewardship” by recycling spent grain to local farmers as livestock feed and minimizing their carbon footprint with responsible production and packaging methods. They were also the first Washington craft brewer to produce their English-style beers in cans, rather than bottles, which avoids exposure to ultraviolet light, cheaper to produce and easier to recycle. “We are a distinctly Northwest brewery that uses malts and hops from Washington and Oregon. We thought that the cans were inherently cool and a good representation of our style,” says co-founder Travis Guterson. But sustainable methods mean little if you’re not producing great beer, which 7 Seas certainly is. My personal favorite was the crisp, refreshing 253 Pilsner, but I liked everything I tasted in their year-round selection: British Pale Ale, Rude Parrot IPA, Ballz Deep Double IPA, Port Royal Export Stout, Cutt’s NW Amber Ale and Cascadian Dark Ale, the first four also available for purchase in cans. Producing 12,000 kegs per year, 7 Seas’ beers are currently only sold in Western Washington, but will also be served during Seattle Mariners’ games at Safeco Field. 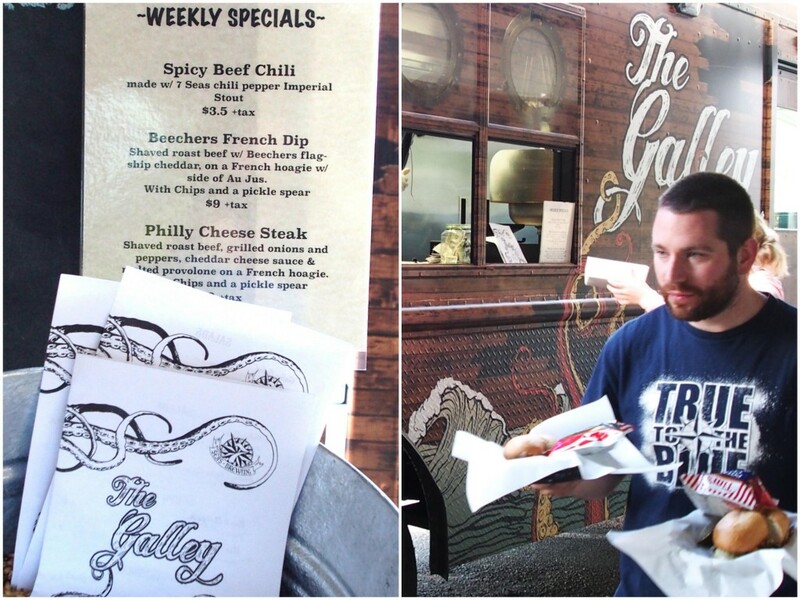 The Galley food truck outside of 7 Seas Brewing + weekly specials menu. Visit the Gig Harbor tasting room to get a six-pack or growler fill of your favorites to go, or enjoy a cold pint in the sun on their pet-friendly patio. Patrons also welcome to bring in foods to pair with their favorite brews, or pay a visit to The Galley food truck onsite, offering seasonal-inspired sandwiches or hearty snacks to share with the whole table. 7 Seas beers can also be found on tap at historic, local favorite Tides Tavern. 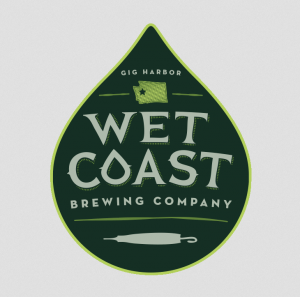 Craft beer fans rejoice: Wet Coast Brewing opened their new Gig Harbor taproom doors on June 19th. The brewery’s name is a nod to the region’s rainy climate, but also apparently references the Pacific Northwest’s reputation during Prohibition as the “wet” coast, largely due to its proximity to Canada and a booming bootlegging trade along the waterways between. First Northwest-inspired beers on tap to include a Pale Ale, IPAs and their signature brown, with hopes to bring a few seasonal brews into rotation. No food is served onsite, but patrons are welcome to bring in food from nearby eateries or order a pizza for delivery. Clockwise from left: Beautiful bottles of Coffee + Blood Orange Vodka in tasting room; Heritage Distillery exterior (flagship location); Justin Stiefel, Co-Founder, CEO + Master Distiller. Every spirit has a story: In 2009, Washington state had zero distilleries. Today, 100-plus craft distilleries can be found within the state, which is more than any other in the nation. Since opening in September 2012, Heritage Distilling is already one of the largest premier distilleries in the Pacific Northwest, producing 10,000 cases annually and using 100% Washington creamy-white wheat from a family farm in Odessa and corn from Moses Lake, with most other ingredients also locally sourced. Their extensive line of Gin, Vodka and Whiskey (including Bourbon and Rye) spirits include the Elk Rider, HDC and Batch No. 12 series, as well as more than 22 flavored vodkas, from Bacon to Blood Orange. Unlike a lot of other flavored-infused vodkas on the market, Heritage Distilling’s triple-distilled line uses only natural ingredients for flavoring—and it shows in every sip. Each vodka I sampled had a true, yet delightfully subtle, flavor profile with absolutely no “cotton candy” artificial sweetener or chemical aftertaste. It’s probably no surprise to Pacific Northwesterners that the coffee-flavored vodka is HDC’s biggest seller, with a nice coffee-bean finish that tastes like a wonderfully light liqueur without all of the added sugar. Likewise, the Elk Rider Bourbon Whiskey was decidedly smooth and deliciously smoky when sipped on its own, but also fantastic when paired with a splash of ginger ale and lime. Seems the judges at the American Distilling Institute’s 2015 Craft Spirits Conference in Louisville must have agreed, as the Elk Rider Bourbon and HDC Cask Club Bourbon were both awarded the Gold Medal in their class. 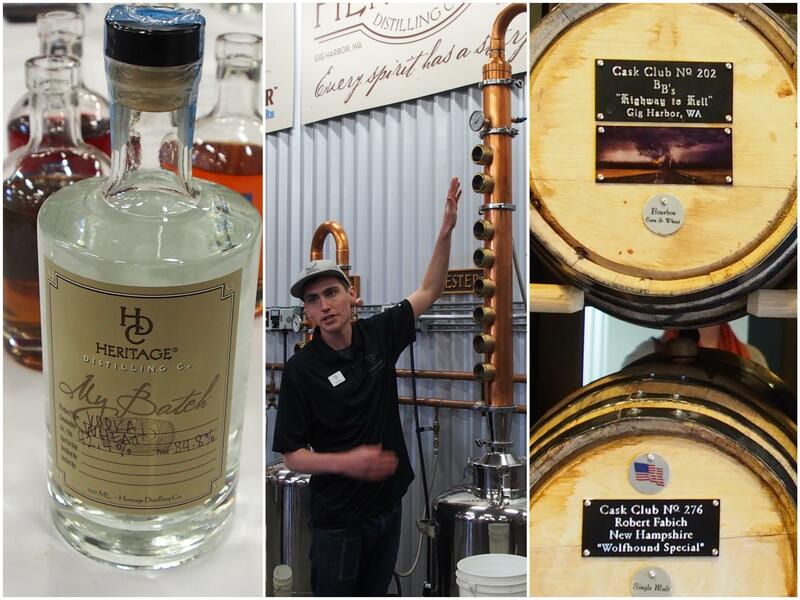 Heritage Distilling won an impressive 14 medals overall, the most of any craft distiller from North America. But to win the gold medal for Bourbon in Kentucky? Now, that’s saying something. “We like to think of ourselves as an idea factory,” says CEO and Master Distiller Justin Stiefel. From reproducing George Washington’s original Rye Whiskey recipe from 1799 to submitting 13 uniquely flavored whiskeys for testing at once, it seems that the creativity for new concoctions flow as easily as the spirits do through their Italian-imported, 2000-liter pot still with copper columns and Kentucky-made microstills. 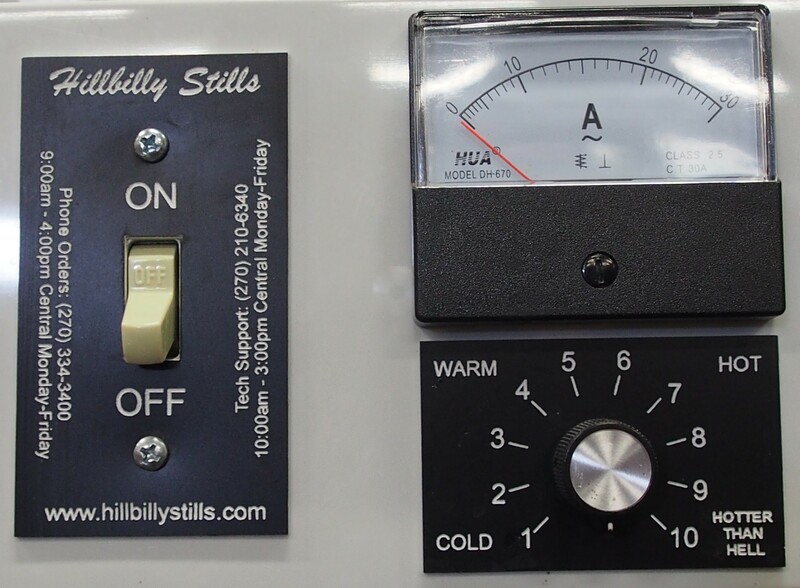 How can you tell if a still was made in Kentucky? There’s a ‘Hotter Than Hell’ setting. 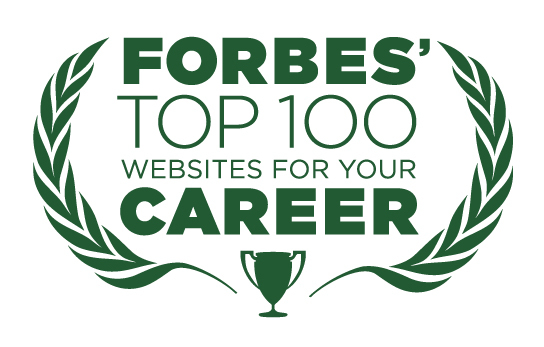 (Click on photo to view larger size). Perhaps Heritage Distilling’s most innovative idea yet is the My Batch program, where visitors can learn about and be involved in the process of creating and distilling their own spirits. Or, take it to the next level with HDC’s Cask Club to custom-age your own spirits in a 10-liter cask that’s displayed in the tasting room with the member’s name and hometown written on the barrel. From left: My Batch Vodka created in class; Head Distiller Dain Grimmer walks us through the distilling process during ‘My Batch’ class; Members of the ‘Cask Club’ on display. Looking for a great holiday gift for the cocktail connoisseur in your life or just want to try a sampling of a little bit of everything? Check out Heritage Distilling’s new Spirits Advent Calendar with 24 minis, sure to brighten your season, one day at a time! 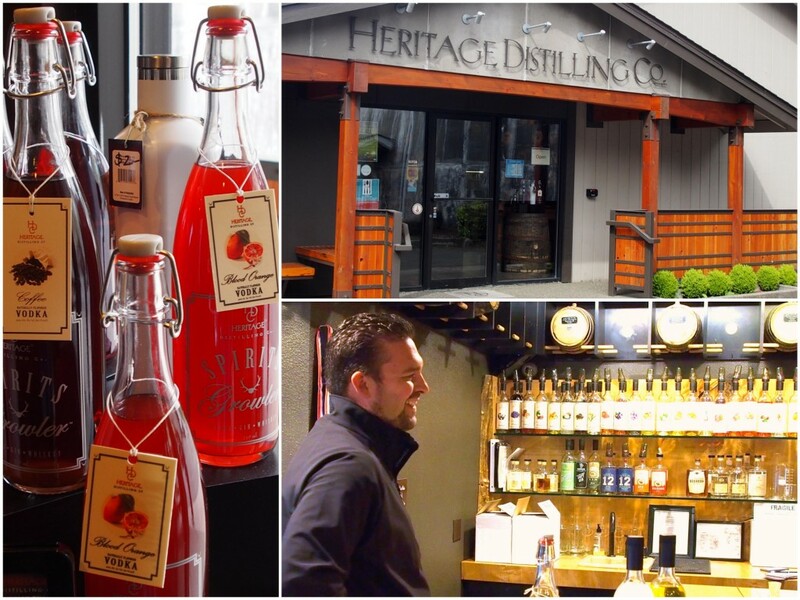 Heritage Distilling now has two distillery locations in Gig Harbor with tastings, tours and retail sales offered at both. A new tasting room in Eugene, Oregon is slated to open in September. 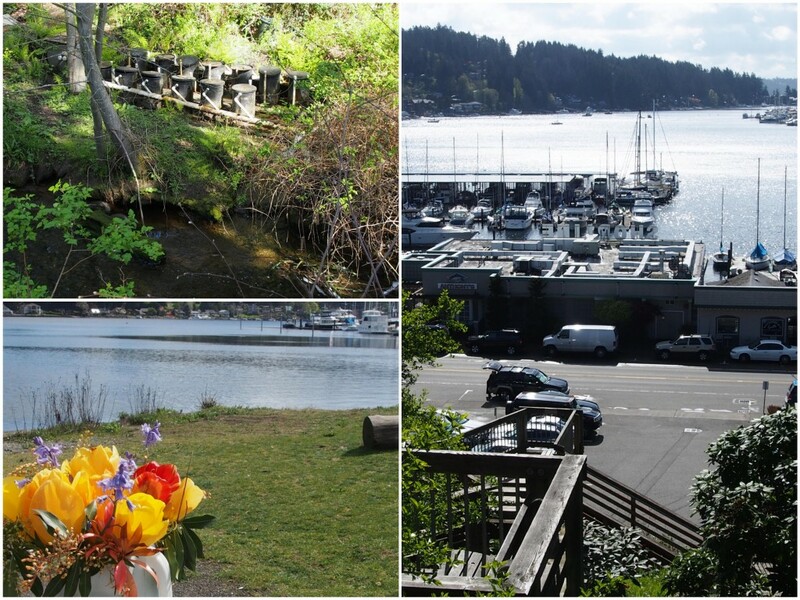 Clockwise from top left: Salmon hatchery near river run at Donkey Creek Park; Harbor view from Finholm Climb; memorial flowers left by mystery man for his wife on picnic table at Austin Estuary Park. 4. Get Into the Green. In search of some natural scenic beauty to go with your hike or bike ride? 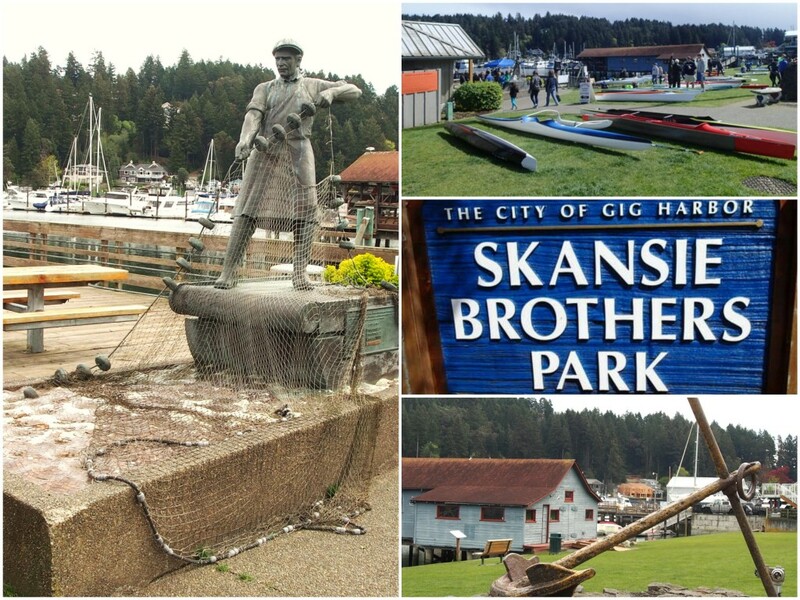 Gig Harbor has some great parks and trails to escape to, if you know where to look. Finholm View Climb: Climb 100 stairs for a wonderful panoramic view of the waterfront, with various view landings on the way up. The Climb can be accessed at 8826 North Harborview Drive (at bottom) or 8917 Franklin Street (from the top). Austin Estuary Park: Looking for a place to have a picnic or stretch out in the sun? This little park next to Harbor History Museum is a great place to relax with a picnic table and water views, also connects to Donkey Creek Park by an under-bridge pathway. If visiting in September/October, there is a viewing deck for those interested in watching the salmon return upstream. Cushman Trail: Since the first section was finished in 2000, the pedestrian and bike-only Cushman Trail has grown from 2.5 miles to more than six miles. More sections of the trail officially opened on May 1, which now extends from the Narrows Bridge all the way to Borgen Boulevard in Gig Harbor North with bench seating and restrooms along the trail. Download a free trail map here. McCormick Forest Park Trails: A 122-acre natural area that boasts enormous old-growth trees, abundant wildlife, plus nearly 4 miles of foot, bike and horse trails. Some trails meander through old-growth forest while others offer views down into the McCormick Creek canyon. Parking is alongside Bujacich Rd NW near the three trailheads. Download a free trail map here. Also, across the street from McCormick Forest is Rotary Bark Park, with an off-leash meadow area for pets. Find more info about the dog park + other off-leash areas here. Sehmel Homestead Park + Trails: This 98-acre community park includes a 3-mile trail system, soccer/football field, baseball and softball fields, basketball and tennis courts, playground, amphitheater, 2-acre open grass meadow area, concessions, restroom, 100-person pavilion, picnic areas, heritage garden, pond and 70 acres of natural area. Download a free trail map here. Sunrise Beach Park: 82 acres with more than 2,000 feet of shoreline, 2 miles of walking trails and forest paths with great views of Puget Sound and Mount Rainier. The park also appears to be a popular scuba diving location to view octopus and other Northwest marine life. Beach access on Colvos Passage. Narrows Park: This off-the-beaten-path park, overlooking the Narrows Bridge and Passage, is one of the “area’s best-kept secrets.” The 36-acre property has 650 feet of sandy-rock beach and a 6-acre waterfront area with paved parking, non-motorized boat and kayak launch, grassy play and picnic area with tables, telescopes and a gazebo overlook. 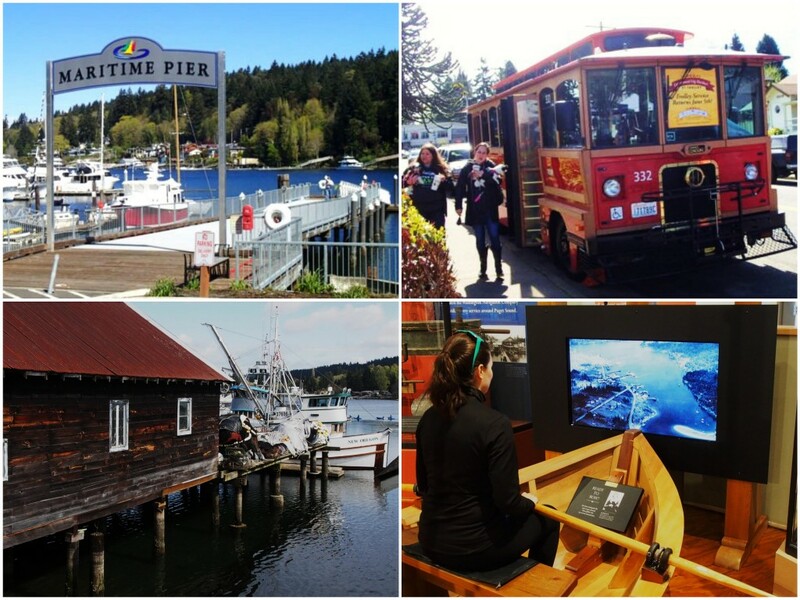 Clockwise from top left: Maritime Pier (meeting point for walking tour); Gig Harbor trolley; Virtual rowboat tour at Harbor History Museum; historic working Net Shed. 5. All Along the Waterfront. Activity in Gig Harbor has always been centered around the historic working waterfront and, rightfully so, the harbor views are incredible. Here’s some of the best ways to take in the sights and learn a little in the process. The Downtown Waterfront Alliance now offers free guided waterfront walking tours on Saturdays at 10am from June 11 – August 27, 2016. (Tour not offered on July 23rd due to the Wine & Food Festival). during The Gig Harbor Wine + Food Festival). The 1.3-mile tour is a one-way, easily trod walking tour along the waterfront. Suitable for all ages, the tour stops at scenic points of interest and features expert guides to give an overview of the harbor’s colorful history and culture, as well as area wildlife and ecology conservation efforts. To participate, meet your guides at Maritime Pier near Tides Tavern 15 minutes prior to start time. No RSVP required, but limited to the first 20 people. 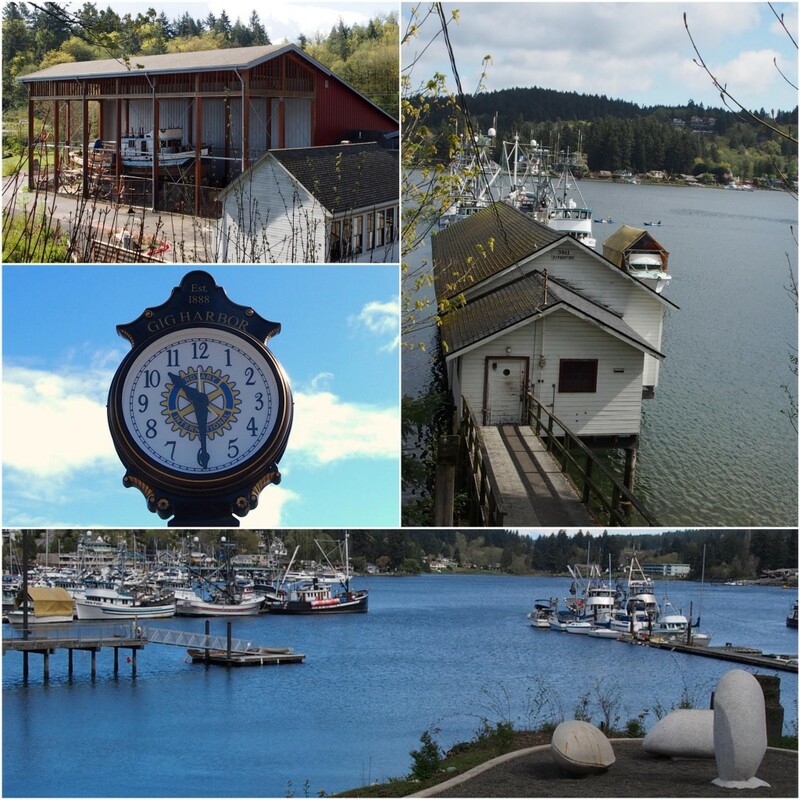 Sights seen along Waterfront Walking Tour: Ship restoration, historic Gig Harbor clock downtown, working Net Shed, harbor views + granite ‘Mussels’ public art sculpture by Verena Schnippert at Eddon Boat Park. Catch a scenic ride back to your car (complete with refreshing breeze) or an open-air tour of the waterfront on the seasonal “Get Around Gig Harbor” Trolley from June 5 – September 7. Fares are 50 cents per ride for adults or $1 for an all-day pass when purchased onboard with cash. Leashed dogs also welcomed, free. Trolley routes, operating hours and complete information here. There’s a new Waterfront Farmers Market, to be held downtown every Thursday, June 4 – September 24, from 3-7pm in Skansie Park. Offerings from local farmers and producers to include fresh flowers to shellfish, produce to homemade pickles, as well as live music, chef demos and a few hot food tables by area restaurants. The downtown farmers market was designed to be held in conjunction with the popular Thursday Night Out, when downtown waterfront shops, art galleries and restaurants stay open later during summer months with special arts and culinary offerings, activities and demonstrations. Want to learn more about the area’s heritage and history? Pay a visit to the Harbor History Museum to explore and learn with family-friendly tours and interactive exhibits. Highlights of the attractions include the original one-room Midway Schoolhouse, remnants of Galloping Gertie, an ongoing restoration of the historic 65-foot Shenandoah fishing vessel and, my favorite, a virtual rowboat tour around the harbor. Open year-round, Tuesday to Sunday from 10am-5pm; tours held April to December. For more information on Gig Harbor, as well as year-round events, lodging and other great places to eat, shop and explore, visit Gig Harbor’s official visitor’s site at gigharborguide.com. 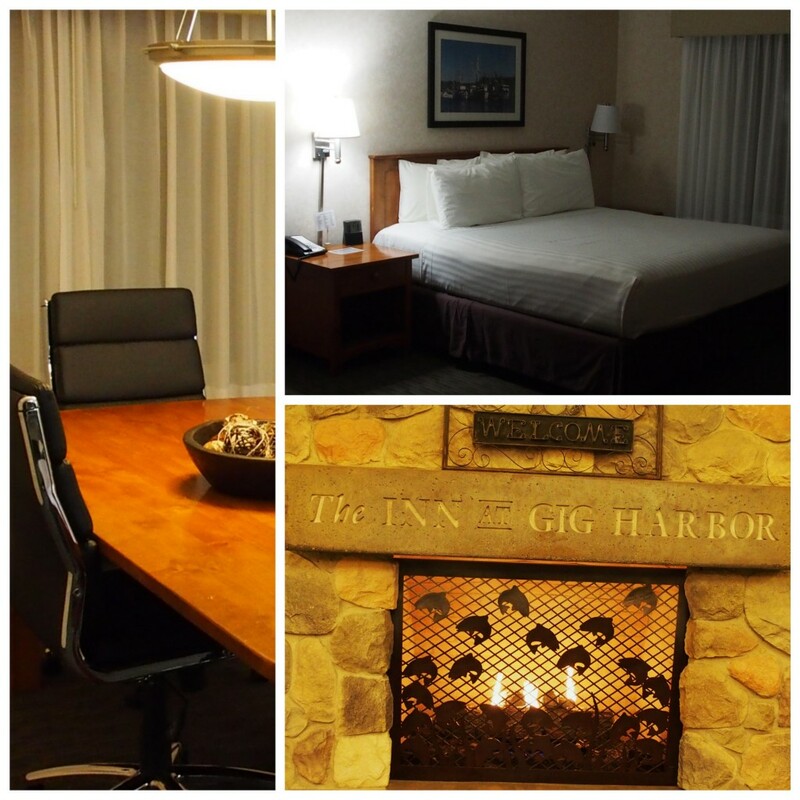 During my visit, I stayed at The INN at Gig Harbor, which has 64 nicely appointed suites, some with fireplaces and jacuzzis, as well as flexible work space with complimentary wifi (perfect for nomads), parking + breakfast. This trip was sponsored, in part, by the Gig Harbor CVB; however, all views are my own.